Not satisfied with Google Advanced Search? Try a dedicated Craigslist search engine such as Search All Craig's, which scours hundreds of thousands of listings and displays them in a Google-style format. You can't specify search terms as categorically as you can with Google Advanced Search; but if your inquiry is general enough, or if you're comfortable using quotation marks to narrow down your desires, it won't matter. Search All Craig's is great for anyone with a devil-may-care attitude as to what city and state in which their results appear--it's especially useful for job hunters unafraid of relocating. Stay away from sketchy and redundant Craigslist search software. While you have lots of useful methods of navigating Craigslist outside of the actual site, there are also far too many programs that complicate the process rather than help it. Search Tempest (formerly Craig's Helper) allows you to set a starting point, no matter how many miles away from your actual location, and search from there. This aspect of the free, Web-based Search Tempest is useful, but it's nothing you can't do with a higher-profile tool like CraigsPal. I felt like my computer was being slaughtered by spyware just looking at the site, and it's downright ugly. 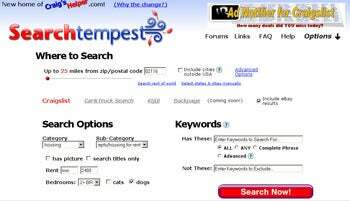 But you don't need it anyway: Search Tempest is mostly a rehash of other available resources. Crazedlist.org also presents multicity searches, but it requires dismantling referrers in your browser. I tried to execute the procedure in Firefox, and the browser screamed that I was wandering into treacherous territory that may be harmful to its stability, security, and performance. Definitely not an app you'd want to tinker with if you value your online safety. The home page of Anthony Damata's Global Craigslist Search Engine announces that it has undergone several crashes and unexplained blocks due to Craigslist interference. Again, I'm far too paranoid a Web surfer to want to play around with something that might harm my computer. Anyway, this search engine acts merely as a direct portal to Craigslist itself, so you might as well just go straight to Craigslist. On the Net you can find many similar programs that all promise advanced Craigslist navigation, but you must weigh the negatives against the positives and craft an educated assessment of your situation. Personally, I found these programs more dangerous than helpful. A lot of people out there are seeking to take advantage of insecure and unknowledgeable Craigslist users. Make sure you're not one of them by watching out for methods commonly employed to grab your money, waste your time, and make you look foolish. It sounds like common sense, but one of the first things you need to do is make certain that you're at the right site. A lot of sites try to make themselves look like Craigslist, so double-check, and ensure that ".org" is at the end of the URL. Keep an eye out for messages that are longer than necessary. If someone responds to your Craigslist post with too much information, it could be a scam. For example, if you're selling your iPhone and someone in Kentucky wants you to send it to his niece but he's paying for it, sell it to the guy down the street instead. Approach e-mail from Nigeria and other parts of Africa skeptically, as many scams originate from those places. Con artists typically offer more money than your advertised price, claiming that they want to cover the shipping or something along those lines. Remember: If it sounds too good to be true, it probably is. Payment options also present dilemmas. Money orders pose a particular threat to unwary people. Although scammers may use a trusted source such as Western Union, they have also devised ways to create fake money orders that will slap you with fees. As always, whether you're dealing with checks or money orders, make sure the payment clears before you send any goods. Try to conduct all sales in cash. The best way to avoid being ripped off is to deal exclusively with local buyers and sellers, approach all offers with caution, avoid people who want you to ship items to addresses that aren't their own (or who ask you to deal with "business partners"), and use common sense. You might also encounter paid services that "train" you how to sell items on Craigslist. Avoid these. Not only will they inundate you with boring information readily found elsewhere, but you may find yourself digging further into debt rather than scuffling your way out. In my travels around the Web, I also found another paid service that promises to help create eye-catching advertisements. Craigslist functions on basic HTML, folks. With a few good photographs and detailed product descriptions, you won't need neon signs to become a successful seller. Craigslist provides a run-through of the most common rip-offs and how to report them, and Fraud Guides has another detailed list. The best way to get the job, MP3 player, or apartment you have your eye on is to be the first in line. Using the tips above, you can easily organize your Craigslist hunt, scope it out while you're on the go, and sell like a pro. In a world where information whizzes past in the blink of an eye, it's critical to maintain the focus that will get you what you want.